Starfleet: The exploratory, colonial, humanitarian and peace-keeping arm of the United Federation of Planets. These are the deep space explorers, the discoverers, the diplomats, the samaritans, the pioneers, scouts, the builders of colonies and starbases as well as their watchdogs and protectors. They know when to be involved with other nations and, more importantly, when not to. There are four main elements to Starfleet: the scientific, exploration, intelligence-gathering and diplomatic element; the engineering, logistics and colonial aspect; the tactical, border patrol and defence role and finally the medical and disaster-relief aspect. 2312 sees the departure of Admiral Hikaru Sulu as the Commander-in-Chief, Starfleet and the successor named as Fleet Admiral Irina Khmelnova. Khmelnova, a known reformer from the review of 2293, gave a speech in which she laid down the shape of Starfleet for the second decade of the 24th Century. The recent treaties at Khitomer and Algeron have shaped the policies of the Federation Council that Khmelnova has to work from. As Commander-in-Chief, Hikaru Sulu set the impetus back from the tense nineties towards exploration, scientific discovery and diplomacy. Sulu set the path towards expansion and solidifying the Federation. A policy of diplomatic engagement and starbase construction was set into motion. Co-operation with other nations was pursued to help stabilise the borders. Admiral Khmelnova has a fleet of over 8000 starships and a network of 105 operational starbases with more due online shortly. The new C-in-C set out her vision to build upon the solid foundations that Admiral Sulu laid down; the path of exploration, expansion with co-operation and friendship towards the neighbours along the borders of the Federation. Khmelnova, who oversaw the Starfleet Review of Stardate 10000, has proposed refurbishing and re-shaping the Starfleet ready for the next decade. The vision is for an Exploring Starfleet, a Diplomatic Starfleet and Protection through Intelligence. This will be achieved with explorers of the Excelsior and the new Renaissance class along with the deep space Constellation class. There will also be a renewed effort to police and secure the borders with monitoring stations and the new Antares class Reconnaissance Cruisers, supported by Apollo and Okinawa class frigates. The 80s, 90s and 00s had overlooked the damaging effects of the piracy and trafficking which was occurring through the porous Federation borders. Intelligence-gathering with Antares, Phantom and Kestrel class ships would also act as a deterrent to would-be threats, as well as conflict prediction and prevention. Khmelnova is also driving forward the programmes to modernise the Starfleet; Flexibility is to be the main asset in this changing universe. Ambassador class is on-track to appear in the early part of the next decade, building on the success of the Renaissance class cruiser. The Constellation class star cruisers are pushing forward the Starfleet mandate to explore new worlds and seek out life. Older starships are either being refurbished or retired as Khmelnova sets out to modernise the Starfleet for the challenges ahead. Building on the orders of President Sh'ghee, Fleet Admiral Khmelnova is continuing the programme of starbase construction, with scouts assigned to survey for new starbase locations. 2311 saw the symbolic inauguration of starbase 100 with over a dozen more planned or under construction; these starbases will help to secure the communications network across the Federation, providing a physical presence for the Federal Government for the colonies and outposts, as well as a place for diplomacy and soft power. Co-operative fleet operations with other navies. Fleet visits to allies, as well as Klingon and Gorn port visits. Alpha Quadrant exploration drive - e.g. U.S.S. Resolution. Beta Quadrant exploration drive - e.g. U.S.S. Albion and Montrose. Venturi disaster-relief and anti-piracy operations. Political engagement with new Klingon Chancellor Kaarg. Tabula Rasa subspace prison observation. Starbase survey and construction programme. Beta Quadrant cultural survey e.g U.S.S. Sheffield and Fearless. Ongoing scientific programme with corporate co-operation. NCC-1701-B Home fleet. Klingon and Romulan borders First forces assembled to fight the Romulan War. The original role-model United States First Fleet was disbanded in 1973 and its duties assumed by the Third Fleet. This may explain why the Third Fleet in Star Trek defended Earth - mirroring the USN 3rd Fleet. NCC-2541 Klingon and Romulan borders also the Holy Order of the Kinshaya and the Metar in the Tabula Rasa sector. Rimward central portion of the Federation. Home-based in Starbase 12, this fleet was originally formed to face the Klingons. This fleet used to cover all of the Federation region along the Klingon border, however this was divided with the Seventh and Ninth fleets. The Second Fleet also faced up to the Metar. Facing the Klingons and the new government of Chancellor Kaarg. Hood NCC-2541 is part of this fleet, as is brand new Graf Zeppelin NCC-14881 soon to be joined in 2313 by Victorious NCC-14957. The Second Fleet is facing up to two realities: a new Klingon Chancellor with a resurgent Empire that the Second, Seventh and Ninth Fleets are monitoring the increased Klingon fleet activities. Also for the Second Fleet is the discovery of the Taubat in our space. The possibility of Metar on the loose is too terrible to contemplate. NCC-2545 Romulan and Ferasan Patriarchy Northern coreward section of the Federation. Formed to fight the Ferasans and keep the First Fleet free. This fleet covers Delta, Aaamazzara, Izar and Sauria. The Third Fleet is based at Starbase 10. It is the principal coreward fleet of the Starfleet. Tracing its heritage back to the signing of the Coalition of Planets' charter in 2154, the Third Fleet was stood up to face the rising Romulan threat. The following year in 2155, the incident with the Ferasans and the NX-01 Enterprise cemented the decision that a dedicated coreward fleet would protect the Coalition on that side. The Third Fleet featured prominently in the Romulan War and was the fleet that maintained the defences of the Neutral Zone after hostilities ceased. Over the last decade, tensions with the Romulans brought the fleet strength back up to war footing. Along with the First Fleet, the Third Fleet prepared to face the Romulans and their new Type A Warbirds. The Tomed Incident brought the conflict to an abrupt halt in the middle of 2311. Eighteen months after Tomed and the Romulan withdrawal, Starfleet is still weary of the Romulans returning in force. Starfleet Intelligence has concentrated assets of the Antares, Endurance, Phantom and Kestrel class ships to the Neutral Zone border to monitor the Romulan activity on their side of the order carefully. The Federation Council has also supported the Federation President in passing a motion to upgrade the monitoring stations along the Romulan Neutral Zone. Ferasan and Romulan stories. The Ferasan DMZ abolition and events post-Tomed. The withdrawal of Romulan diplomats from the Federation over 2312 back to Nimbus III as a neutral point before returning to Romulan space. U.S.S. Renown NCC-2545 and brand new U.S.S. Tecumseh NCC-14924 assigned to this fleet. The Nimrod mission is covertly heading to find the Borg. NCC-2002 Tholians and Caitians Mid-Rimward region of Alpha Quadrant. Protects the Caitian and Pacifica systems up to Grazer. The Fourth Fleet is based on Cait and is one of the 23rd Century expansionist fleets, along with the Fifth, Sixth and Seventh. The Taurus Reach campaign of the 2260s saw the rapid multiplication of fleet size as Starfleet Command looked to counter both the Klingon and Tholian presence in this region. The loss of the U.S.S. Defiant, NCC-1764, was a heavy blow but one that the Fourth Fleet built up from. Tholians. The 2312 re-visiting of this enigmatic alien race from Future Tense, The Tholian Web and the Vanguard novels. The region of space has �thin� boundaries between dimensions including the mirror universe. Starfleet studies the very nature of subspace here. U.S.S. Adventure page covers this. Antares class Oxford and Endurance class Barnwell are in the region too. Starbase 117 is under construction and the Mughi class Hitomi and Jupp class Osterhaus and Reeves are both assigned. NCC-2002 U.S.S. Columbia is the flagship of the fleet. Brand new U.S.S. John F Kennedy NCC-14902 has just completed her shakedown and has joined the Fourth Fleet. Brand new U.S.S. Potemkin NCC-18253 is due for shakedown for this fleet in 2313. Renaissance class U.S.S. Shakespeare, Botticelli and Palmieri are currently assigned to this region. The Tholian species runs on being a mystery, so lots of Dr Who-style �I�ll explain later� moments. NO use of the Starfleet Battles/Starfleet Command version of the Tholians here. These are xenophobic Y-class �Demon� world-inhabiting crystalline creatures. Their physical lifespan is short but I surmise they get �downloaded� into new bodies after being uploaded into the Lattice for a time. This lends the Tholians a truly alien slant on the concepts of life and death. Tholian space is as unusual as they are, with a high number of Y-class planets and the subspace barriers in the region are �thin�; perhaps the two aspects are linked. The ST: Star Charts book suggests there are good relations with the Tholians since the 2270s but with the Vanguard revelations of short life-spans and reviewing borders etc, I�d say that relations �fluctuate�. ENT: In A Mirror, Darkly also featured the Tholians with an energy-dampening weapon. Something refreshingly different from the usual disruptors and torpedoes. NCC-14221 Cardassian Union, Tzenkethi Coalition and Talarian Republic Established to control the border region around the newly discovered Cardassian Union, Tzenkethi Coalition and Talarian Republic borders. This is a diplomacy-driven Fleet based on Trill, wanting to make a good first impression. The mission to Ab-Tzenth in 2312 with the Farragut, ended in failure. Tensions in the region have risen following the loss of former flagship U.S.S. Excelsior NCC-2000 near the Tzenkethi border. Fleet Admiral Margaret Sinclair-Alexander authorised the securing if the Federation-Tzenkethi border with additional tactical elements, whilst intelligence-gathering assets would work with the diplomatic corp, to identify the reasons for the failure of the first diplomatic initiative and be better prepared for the second. A sub-division from the old Fourth Fleet. 14221 Farragut with McCoy and Ambassador Spock go to the Tzenkethi for failed first contact attempt at relations in 2312. Javelin page deals with this in part. Question whether to lose Excelsior destruction or not (from the novel 'One Constant Star'). Brand new Excelsior class U.S.S. America NCC-18297 is on shakedown in 2313, this replaces the Levant variant that was lost. Renaissance class Donatello, Solario and Clouet are assigned to this fleet. The Fifth Fleet is purpose designed to address the Tzenkethi and Talarian borders that have recently increased in importance. NCC-14771 Unexplored space on the rimward edge of the United Federation of Planets Rimward reaches of Alpha and Beta Quadrants. This protects and controls the region near Betelgeuse. The Sixth Fleet, sometimes referred to as the 'Southern Fleet' covers the region operating furthest rimward of the Federation. The fleet operates with a Lexington command cruisers for the Fleet Admiral: the U.S.S. Blue Ridge. The frontier fleet heading South. U.S.S. Investigator story and Rattlesnake are all part of this along with Blue Ridge command ship, Lexington class and brand new Excelsior class Discovery NCC-14771. Potential story of studying wrecked Genesis planet and the remains of the Mutara Nebula. I suspect Regula One was destroyed in the Genesis detonation. U.S.S. Bulwark NCC-6213 attached to this fleet. Renaissance class Ushakov, Pannonius and Castanheda are allocated to this fleet. With a lack of starbases constructed in this direction, Jupp class Escorts are found in number here. The latest Hermes variant, Pillinger class, is also found here in strength for scouting missions. Fleet headquarters are at Starbase 44 and amongst the tactical assets are the Ark Royal class Pegasus and the dreadnought Arkansas. NCC-14427 Klingon Empire As established by Tales of the Seventh Fleet and the U.S.S. Justice team. Starbase 7 is the fleet headquarters. Works with the Second and Ninth Fleets regarding the Klingon Empire. In DS9 they lost 98 of 112 ships, which were later replaced; this gave the first indication of the vast size of a fleet, although the 112 ships would be mostly the tactical elements and discounting those unserviceable. NCC-14598 Gorn Hegemony, Mirak Star League, Lyran Star Empire, Lyran Democratic Republic Newly-formed fleet that is specifically designed to address the crescent of nations on the underbelly of the Klingon Empire. Based around the region from Bellatrix, Regula, Cestus and Ceti Alpha driftward towards the Hydran Kingdom. Divided off from the Seventh Fleet. This region has increased in importance. Starfleet Command is concerned at the de-stabilising of the Klingon Empire and the political ripples this is sending across the Beta Quadrant. Intelligence assets including Endurance, Kestrel and Phantom class ships have been directed to monitor the revolution. Starfleet Command is currently liaising with the Eighth Fleet to provide a peace-keeping force, if necessary, to secure the border from being compromised by either side. The political ramifications of such a move are imense, so a diplomatic effort is underway in ernest. NCC-6212 Syr'Ypt'Q Kingdom New fleet that came from the forward-deployed element of the second fleet. This fleet covers the driftward arm of the Federation on the far side of Klingon space. NCC-2100 Spread across inner Federation Reserve fleet consists of tactical classes mothballed between conflicts and decommissioned starships awaiting scrapping. Classes include: Saladin, Hermes, Constitution, Federation, Menahga, Phobos, early series Akula and Okinawa and Maguellanes. A cross between NASA, ESA, Russian Space Agency, the US Coastguard, the British Antarctic Survey, HMS Protector and Endurance and the Hydrographic elements of the Royal Navy: Echo, Enterprise, Magpie and Scott; Starfleet is the exploratory, diplomatic, colonial and defensive arm of the Federation. Star Trek, and therefore Starfleet, is NOT "Hornblower in space"; that analogy is purely to inspire Summer blockbuster movies. Star Trek is about James Cook and the Endeavour, Adventure and Resolution, about Charles Darwin on the Beagle, Robert Falcon Scott on the Discovery, Ernest Shackleton on the Nimrod, the astronauts and cosmonauts who have gone up in rockets, shuttles and space stations. The primary mission of Starfleet is to seek out new life, new civilisations and planets to colonise. With the ever-expanding population of the United Federation of Planets comes a need for planets to live on plus resources to power and feed the people. Exploration serves the purpose of gaining new knowledge, new friends and also surveying for the following colony ships. Based in San Francisco on Earth, Starfleet has a fleet of over 8000 starships spread over nine fleets, which in turn are sub-divided into task groups and those which operate on a solo basis attached to those fleets. All of the information from these starship and starbases are relayed live back to Starfleet Headquarters, real-time where possible, and added to the Memory Alpha library of knowledge for the Federation. Think of it like pin-head sized objects scattered around a football stadium, palace, shopping mall or other large building site; you may have 8000 ships but they are scattered across the immense void of space. In addition, over one hundred starbases extend the supply and communication lines across the Federation, enabling starships to conduct their deep space missions. A fleet of Starfleet Auxiliary vessels supplement these starbases, allowing starships to journey far beyond the borders of the Federation. These starships are on a primary mission to seek out new life; mostly this life is single-celled biological organisms but occasionally it is complex carbon or silicon-based life. Starfleet has a scientific element that are ready to address the cultural and linguistic challenges of a first contact scenario aboard most starships. Probes usually paved the way for manned starship expeditions but occasionally an alien starship will cross our way unexpectedly. There are biological and chemistry experts onboard along with medical scientists to fathom the workings of the life that is discovered. A deep space explorer will be ready for all eventualities, whereas smaller frigates and science vessels will have a simpler arrangement of specialities. Team 1: Habitation Seekers Planetary Scientists, Astronomers, Statisticians, Biologists, Environmental Science - the roles to locate planets, comets, asteroids or other phenomena that might hold the potential for life. Team 2: Life Seekers Biologists, Botanists, Oceanographers, - the specialists for finding life on planets or other media. Everything from single-celled organisms up to complex animals, plants etc. Team 3: Proto-Intelligence Biologists, Linguists, Evolutionary and Comparative Psychologists. Once life is found, these assess the potential intellectual capacity of that life for intelligence. Team 4: Intelligence, Culture and Civilisation Psychologists, Sociologists, Political Sciences and Linguists. This team looks at intelligent life with civililisation, cultures, their relationships with each other and life around them. An assessment is made of their relationship with their neighbours, especially when they achieve space-travel. Team 5: First Contact Impact Team Medical Doctors, Environmental Sciences, Psychologists, Sociologists. This team looks at the possible and probable effects of first contact with the other species. The emphasis is on avoiding contamination, both in a disease sense and cultural sense. A starship needs to go into first contact with eyes wide open; all the numbers run on probabilities and options. Starfleet has many component divisions including: Starfleet Operations, Starfleet Medical, Starfleet Corps. of Engineering, Starfleet Security, Starfleet Intelligence and many others. Each element has an admiral in command, as well as their own office - all co-ordinated from Starfleet Headquarters. 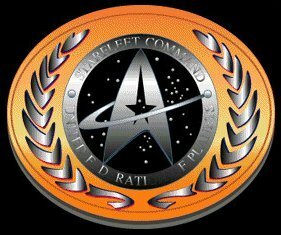 Starfleet answers to the Federation President and the Federation Council. Leading Starfleet is the Starfleet Commander-in-Chief. The Commander Starfleet - or CinC - liaises with the Federation President and the council. There are nine Fleet Admirals, all in command of their respective fleets. The starbases and space stations scattered across the Federation are commanded by Commodores and Rear Admirals, extending the authority of Starfleet Headquarters to the final frontier. The importance of these lines of communication cannot be overstated; Starfleet is the spearhead of exploration and discovery: decisions are made every day on whether to make contact with other life and their nations or whether, more commonly, to observe them from afar and leave them to develop on their own. Starfleet and the Federation have learned to act responsibly, not to contaminate other cultures with ideas, waste products or technology. To interfere in the affairs of others is to potentially drag Starfleet and the Federation into internal affairs and conflicts which we know nothing about and certainly cannot take sides. The PRIME DIRECTIVE exists for GOOD reason. The scientific elements of Starfleet are honed to precision for this purpose; to be able to study life and other civilisations without making them aware of our presence until the time for making first contact is appropriate - IF IT EVER IS. If the political or cultural values of another nation of life is in conflict with the values of the Federation then, like the Klingons 2154 - 2256, they are consciously left alone and observed from afar until a diplomatic approach can be made, or the insurmountable values of the other nation change favourably. As an organisation of peaceful exploration and diplomacy, Starfleet rewards academic achievement, diplomatic success and new discoveries. Unlike a military organisation, Starfleet sees the use of force as a failure in diplomacy, the last resort, a most distastful one at that. many members of the Federation have experienced warfare in all of its dreadful forms. None wish to experience it again. For centuries, humans engaged in war to resolve their differences, acquire resources and strike out against those they did not understand or like. Meanwhile the people starved and suffered from terrible diseases as resources were wasted on fighting. It was only after Earth was almost sterilised in the Third World War of the 21st Century that the human race finally realised the futility of war. The unsuccessful diplomatic overtures of Michael Burnham in May 2256 led to a year of conflict with the Klingon Empire in which a fifth of the Federation was occupied and a third of Starfleet was destroyed. After the war was resolved, the Federation and Starfleet had to re-examine the events leading up to the conflict and the timeframe of the war itself; to learn from the mistakes. A failure of diplomatic engagement earlier and underestimation of the Klingon threat was one factor. A failure to follow-up on the Klingon-related missions of NX-01 Enterprise is another. A diplomatic initiative was the first priority. The intelligence-gathering and defensive elements of Starfleet were to be re-examined and enhanced to prevent a repeat. The conflict simmered as a Cold War from 2257 - 2293. With diplomatic relations with the Klingons fully established after the Khitomer Accords were signed on Stardate 9529, Starfleet began to remodel itself ready for the new century. This was a time to realise the ideals of exploration, scientific discoveries and diplomacy; Starfleet was to reassert the peaceful exploration of space and relegate defence to a last-resort aspect. The Cold War with the Klingons was resolved with diplomacy and words, not with combat. Older starships were retired and new designs were prototyped. Similarly the starbase and space station network across the Federation and the frontier were reviewed to be renewed, improved and their communications facilities enhanced; this was a time to close the net and bring the situational awareness of the Federation to new heights; conficts were to be anticipated and diffused before they developed. New information, from sources such as the El Aurians from the Lakul and from encounters with the Taubat and Metar made Starfleet Headquarters aware of new dangers on a level unseen in the history of the Federation so far. We had to be ready for these perils. Tension with the Romulans soon stalled the process, but with the recent Tomed Incident having 'cleared the air', the major shipyards such as those at San Francisco, Copernicus, Utopia Planitia, Vulcan, Andoria and Starbase 134 are now working in earnest as the review of Starfleet continues. From stembolts to starships - all of Starfleet is changing, to face the new challenges of the new Century. Campbell Award - a Federation prize awarded to a person who makes achievements in several fields including life sciences. Jalhal Award - academic distinction given for excellence in warp field studies. J. Bruce Award - Federation prize awarded to a person who makes achievements in a field of technology, science or engineering. 1 Full phaser and torpedo arc. 2 Phasers with photon torpedoes [forward only]. As set out in Star Trek: The Next Generation Season Two when the U.S.S. Lantree was designated a 'type 6 supply ship with type 3 defenses'. I hope you have had your cup of tea or coffee recently, or that there is one nearby. This is the serious business of Starfleet and number-crunching [yet again]. I have had to use various sources for the numbers that I know of, and a few educated guesses to fill the gaps. Of the most help has been the Starship Spotter book, providing figures for the orbital starbases, which I averaged to a round figure of 75 000, added to which the average crew compliment of a starship [the majority of which are Saladin/Miranda sized, is about 200 per ship, 1 200 ships in the fleet, therefore 240 000 serving onboard a starship, and 82 000 serving on starbases [of which there are by 2302 some 82 starbases either online or nearing online status. Starbase numbering system is also the question of some debate. The rules for starbase numbering were invented in the original series. Seventeen bases were said to be operational for Jim Kirk, there are five hundred for Jean Luc Picard's Enterprise-D, therefore a nice curve for incrementally increasing construction must be plotted to fill the gaps [see table on Starbase 77 page]. There have been very few references to the size of the Starfleet in Star Trek. The only series [to date] that has given any clues was Deep Space Nine, although storylines in the movies and The Next Generation also give hints. In Deep Space Nine episode 'A Time to Stand', Bashir talks of the decimation of the Seventh Fleet, to which General Martok talks of there being one-hundred and twelve ships in the Seventh Fleet. This fleet was later mentioned with more ships having joined the fight in this corner of the Federation - suggesting 112 ships was only part of the 7th Fleet. The other major indicator of fleet size comes from an article in Sci-Fi and Fantasy Models Magazine issue 32 which features an interview with Foundation Imaging, the CGI company responsible for later Trek series computer wizardry. In the article 'Deep Space Nine: Sacrifice of Allardice' John Allardice states that there is fully 'half of Starfleet's capacity' involved in the episode 'Sacrifice of Angels'. In 'Favor the Bold', O'Brien states that there are '1254 [Dominion] ships', to which Bashir notes they outnumber the Federation fleet two to one. Therefore since this is supposed to be half of the Starfleet, the full fleet must number around 1200 ships, approximately. Another factor to consider when discussing the size of the fleet is the size of the Federation which the fleet serves. The Federation grows exponentially. If the UFP started life as size x, then by the time of Kirk's original command the UFP would be size x(10) and by Star Trek VI would be x(100). In short, as time passes, so the size of the Federation increases at an ever faster rate [exploration is a 3-dimensional process]. Therefore Starfleet needs to increase the number of starships in the fleet at an equal rate in order to maintain the same level of operations over the increased volume. Connected, and counterbalancing the need for more ships to cover the increasing area of space is the increase in both the size and capabilities of the starship designs that comprise the fleet. For simplicity, these factors shall be taken to negate each other - the larger the area that the Federation is covering, the more capable the starships are becoming at covering the larger areas. In the time of Deep Space Nine, and the Dominion War, there were references to at least ten fleets [Tenth Fleet was outflanked during 'In the Pale Moonlight'], each having approximately 120 ships in the fleet. Obviously during Star Trek the Interim Years the Federation is not at war, thus starships are only loosely associated with fleets [for administrative rather than maneovre reasons]. How many fleets would control the Starfleet in the dawn of the 24th Century? With only 8000 starships, ten fleets seems a little too much - not to mention some of the fleets assembled in DS9 were purposefully assembled for the war. Seven or eight fleets seems more than adequate for 'normal' operations in peacetime.